The Practice Out of Hours provider is called ICT24 which is commissioned to provide a medical service for us by the Basildon and Brentwood Clinical Commissioning Group. ICT24 use NHS 111 to provide medical care. When you telephone the surgery when we are closed you will hear a message that says you can hold on and be directed to the Out of Hours service or alternatively you can dial NHS 111 directly. 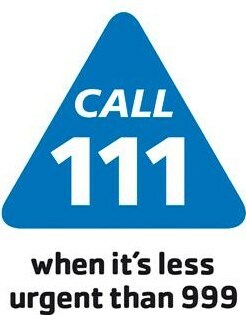 If you dial directly to 111 your call will be free of charge. BB Healthcare Solutions - known as "The Hubs"
We work with other Practices in the area to provide appointments in a location, other than at the Practice, for appointments between 6.30 - 8.00 pm Monday to Friday and at other times over the weekend. You can request "Hub" appointments or, when there are no appointments at the surgery, we may offer you "Hub" appointments. Please note that these appointments have been put in place to offer an extended appointment service to all patients in our locality.